Where do the BRICS (Brazil, Russia, India, China and South Africa) countries stand in relation to the current conflict in Gaza? How do they compare to the dominant external power in the region, the US? What do their responses to the crisis reveal about their broader global aspirations? Examining the BRICS is important for several reasons. Although they differ greatly in terms of their economic size (e.g. China’s status as the second largest economy versus South Africa’s much smaller size) and political orientation (democratic Brazil, South Africa and India versus more authoritarian Russia and China), they have become a shorthand for describing those countries which are emerging as ‘rising powers’ within an increasingly multipolar world. In addition, they have developed common strategies and actions over the past decade, including regular summits and, most recently, the creation of a mutual financial instrument. Despite these common activities, there has been no attempt to coordinate foreign policy objectives. And this is evident in the way that the five have individually responded to the violence inflicted on Gaza over the past month. Yet those differences must also be set into the context of a broadly common international consensus in relation to the Israeli-Palestinian conflict, specifically a commitment to two states (one Jewish, one Arab) which was first proposed and adopted by the United Nations (UN) following the referral of the Palestinian question in 1947. That position is reflected in the current framework for negotiations, namely the 1993 Oslo accords which provided the basis for talks to establish a Palestinian state in exchange for Israeli security. Although Oslo proposed a final agreement within five years, this was never achieved – a situation which has persisted despite intermittent efforts to restart and conclude talks. Like the international community, the US is committed to Oslo. However, its efforts at being an honest broker have been undermined by its strong support of Israel at the expense of the Palestinians. The US maintaining a close association with Israel contrasts with its position in the past. Although it was supportive of Israel’s establishment in 1948 it was not especially active in providing assistance to the new state. Indeed, the Eisenhower administration roundly condemned Israel’s aggression alongside that of its British and French allies during the 1956 Suez conflict. It was only during and after 1967 when the Cold War expanded to make the Middle East a proxy arena that the close ties between the US and Israel on one side and the Soviet Union and its Arab allies (including Egypt, Iraq and Syria) on the other became more apparent. Prompted by a strong pro-Israel lobby in Washington, successive US governments have adopted an extremely supportive position in relation to Israel, including the use of vetoes or abstentions in the UN Security Council when Israel has been criticised. With the end of the Cold War, the US has stood alone as the dominant global power. A confluence of changes in this period encouraged the Palestinian leadership to reach out to Israel, resulting in Oslo. As part of the process the conflict was internationalised, with the US providing diplomatic support along with financial assistance (the latter which was also provided by the EU as well). Although Washington saw itself as an honest broker, few others did. As the peace process faltered and violence broke out between Israel and the Palestinians after 2000, the US continued to side with Israel, both diplomatically at the UN and in physical support, including continued military assistance. During the time of the Second Intifada (2000-05), the Quartet was established to try to broker a diplomatic solution and consisted of the US, UN, EU and Russia. By the mid-2000s the Second Intifada had wound down. Israel became the dominant party in the conflict and the Palestinians were economically, politically and territorially weakened through the construction of the wall, the siege of Gaza and the denial of Palestinian self-determination. This state of affairs has persisted over the past decade, including the previous Israeli military interventions in Gaza in 2008-09 and 2012. The BRICS: a challenge to the US? Since June, Israeli aggression in the occupied Palestinian territories has escalated, in both the West Bank and Gaza. How have the BRICS countries responded? Like other countries, including the US, the BRICS have appealed for moderation and an end to the violence. To this extent, they do not offer a radically different stance from Washington’s. But at the same time, when examined closely, the nuances within those appeals have varied, from strong criticism of Israel to relative invisibility from India, private support of Israel by Russia’s President Putin and China advising a return to talks. Last month Brazil voted to investigate Israel’s actions in Gaza in the UN Human Rights committee, which 28 other countries supported against 17 abstentions and one vote against (the US). A few days later, on 24 July Brazil recalled its ambassador to Tel Aviv, calling Israel’s action ‘disproportionate’. By recalling her ambassador, President Dilma Rousseff may have echoed the sentiment of her pro-Palestinian Workers Party, but it also marked a change from her predecessor, Lula. During his presidency (2003-10), Lula had claimed that Brazil could be the honest broker and that the US could not be, because it was determined to keep open channels of dialogue with both sides. However, it received short shrift from the Israeli foreign ministry, which called Brazil a ‘diplomatic dwarf’ as a way of diminishing the impact. Despite this, Brazil’s action was in line with that of other Latin American states. By the end of July Chile, Peru and El Salvador had also recalled their ambassadors. Increasingly, Latin America has been acting in broadly the same fashion. In 2010 Brazil and several other countries in the region recognised Palestine as a state, which preceded the Palestinians’ attempt to have that status recognised at the UN the following year. Latin American attitudes towards Israel appear to be hardening; a striking development for a region which broadly voted in favour of the UN’s 1947 partition plan which provided the basis for a Jewish state. More recently, Latin America’s diplomatic response to Israel’s actions in Gaza is more strident than among some Arab states, whose support of the Palestinians has been muted (mainly because of these rulers’ antipathy towards the political Islam of Hamas). As in Brazil, the South African governing party, the African National Congress (ANC), has been highly critical of Israel. The party’s deputy general secretary, Jessie Duarte, used robust language to described Israel as turning the ‘occupied territories into permanent death camps’, which brought an angry response from the country’s representative Jewish organisations. Duarte’s words reflect the ANC’s historic identification with the Palestinian struggle. Officially, however, the ANC government has used more measured language; while criticising Israel and promising $1m in humanitarian relief to Gaza, President Jacob Zuma also made sure to include a reference to the threat to Israeli civilians as a result of the missiles fired from Gaza. Unlike Brazil, South Africa has not recalled its ambassador, although the government did announce that it would prosecute any South Africans involved in the conflict. The statement was made in response to a pro-Palestinian advocacy group that opened a case against an alleged South African serving with the IDF in Gaza. In contrast to Brazil and South Africa, the response from New Delhi has been extremely muted. In India there have been solidarity marches in support of the Palestinians in New Delhi, but relatively little attention in the media to the conflict. The government has been reticent on the subject, adopting a balanced approach which criticises disproportionate damage by Israel and the rocket fire from Gaza. This is in marked contrast to an historic pro-Palestinian stance in the decades following independence. Why this is the case has been examined by The Diplomat correspondent, Sanjay Kumar. He has suggested that geopolitical considerations, including Israel’s status as the largest arms supplier to India and India’s closer ties with the US, has encouraged it in this direction. This may also be due, in part, to the long term diminishing of third worldism and the decolonisation impulse and more recently the absence of a strong ideological commitment to these goals in the historically dominant Congress party. Admittedly, the current conflict in Gaza has occurred following the recent election of a Hindu nationalist BJP government, which is more focused on concerns within its immediate neighbourhood. Despite this more regional focus, Kumar notes the concern of Indian academics and analysts who believe that by failing to show leadership over this (and other) issues, New Delhi is undermining its claim to be a global power, along with its long running campaign to gain a permanent seat on the UN Security Council. Internationally, the Russian government has been at the centre of a diplomatic storm with the West over its involvement in the Ukrainian crisis and whether it was directly or indirectly responsible for shooting down a Malaysian Airlines flight travelling over eastern Ukraine last month. Most recently, this has resulted in a spate of economic sanctions being imposed by the US and EU. Russia differs from the other BRICS owing to its institutionalised diplomatic presence in the Israeli-Palestinian conflict as a member of the Quartet. In between these issues, Russia’s representative at the UN sought a balanced approach to the Gaza crisis, criticising the killing of civilians by Israel while also denouncing the firing of missiles from Gaza. During one of the UN Security Council meetings, he stated that Russia was willing to consider (although not explicitly) a request from PLO leader, Mahmoud Abbas, to make Palestine an international protectorate. While Russia publicly presents itself as a dispassionate observer of the conflict (the Russian news agency, RIA Novosti, reported on 23 July that President Putin had spoken to Israeli prime minister Netanyahu that he was prepared to mediate between Israel and Hamas in searching for a ceasefire), the Moscow Times notes that at a personal level Putin identifies with Israel and its ‘attempts to protect its citizens’. This may be due to several reasons, including the strong Russian Jewish population in Israel as well as Putin’s and the Israeli government’s shared opposition to ‘terrorism’. Despite these sentiments, it is unlikely that Russia under Putin will come out publicly and strongly support Israel; it has other diplomatic commitments elsewhere in the region, including ties with the Damascus regime in Syria and involvement in the current nuclear talks with Iran, which require it to maintain a distance. Prior to the current conflict in Gaza, China’s Middle East envoy (a position which it first introduced in 2002) visited the region and spoke in support of the two-state solution and encouraged negotiations between the two sides and to ‘meet each other halfway’. This more measured approach reflects the broader policy that Beijing has pursued since the 1990s. Historically, the Chinese leadership was pro-Palestinian, a position which reflected its third world commitment to the developing world and political revolution. From the 1980s the government adjusted direction, focusing less on ideological purity and more on economic development. While this initially occurred at the domestic level, the 1990s and 2000s saw China’s economic importance rise through greater trade. Meanwhile, in the Middle East China had established relations with Israel in 1992, partly to counter the diplomatic isolation it had faced by the West and its allies after the Tiananmen Square repression, but also to make purchases from Israel’s sizeable arms industry. 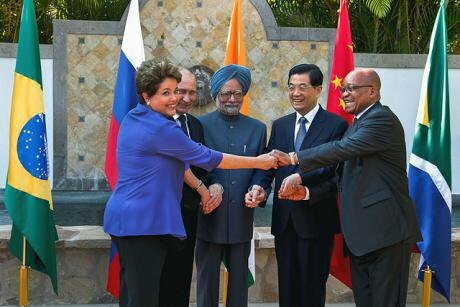 The role of the BRICS: does it matter? Although the BRICS broadly share the international consensus in favour of an end to the violence, a more moderate stance by the two sides and ultimately a two-state solution, there have been some differences in nuance. Yet does any of this matter? Can rising powers such as the BRICS countries make a difference in relation to Gaza? To answer this, it is worth looking at the issue from two viewpoints. One way is to ask whether a rising power can have a direct impact on the conflicts actors, Israel and the Palestinians. If this is not the case then it does not matter whether a BRICS country is critical or not of a particular party, especially if it’s the stronger one of Israel. For most of the BRICS, their relationship with Israel is mostly diplomatic; beyond making official statements, they have limited influence to offer. The one exception to this is China, owing to its importance as the world’s second largest economy and a key source and destination of the world’s imports and exports. China’s economic weight means that neither Israel nor the Palestinians can afford to ignore Beijing’s wishes. By contrast, BRICS like Brazil and South Africa have less trade with Israel (and the Palestinians), making them much less important economically. India, meanwhile, imports a sizeable amount of Israeli arms, which may potentially discourage it from taking too strong a stance. And Putin’s sympathy for the Israeli position means that he cannot be seen as an honest broker in any settlement. Another way that a rising power might make a difference to the conflict would be to challenge and change the framework associated with the conflict. This would involve moving away from the established way of dealing with the conflict as one between two equals. To do so is a fallacy: Israel is a state, which in Weberian terms means control over a physical territory with a monopoly on the tools of coercion (i.e. police, military); by contrast the Palestinians are a national group without a state; the West Bank and Gaza are defined as being under occupation. Although Oslo enabled a transitional government, the Palestinian Authority, to be established in the occupied territory, it does not have the attributes of a state. Its room for action is framed and contained by Israel. As an example of this, the West Bank is divided into Areas A, B and C. The PA is responsible for administration (and theoretically security) in Area A where the majority of Palestinians live in the principal urban areas. In Area B, the PA has administrative responsibility and Israel controls security while in Area C, which makes up two-thirds of the West Bank, Israel has sole administrative and security control. From this perspective, China’s approach is not transformative. It does not present a change from the dominant diplomatic paradigm of the conflict, since it explicitly promotes a return to talks – the very same model that has persisted since 1993. Meanwhile, Russia and its support for the dominant actor, Israel, would merely reinforce the status quo. This therefore leaves the two countries which have been most critical as offering a move in this direction: Brazil and South Africa. Of the two, Brazil has challenged the status quo by recalling its ambassador in order to make clear that the current arrangements and power disparity is unacceptable. If this was followed by other measures to criticise and challenge Israel’s behaviour, this might yet yield significant results. However, those seeking a new way out of an old problem should not be cheering just yet. Indeed, Brazil’s approach continues to occupy the dominant diplomatic paradigm associated with the conflict, where statements are restricted to the official sphere. Moreover, everyday realities will continue to be important. In this instance the relative economic weight and impact that a country can bring will continue to be significant – especially if it is followed up with sanctions, as advocated by the Boycott, Divestment and Sanctions movement in Palestinian civil society. Brazil and South Africa are relatively insignificant to the overall Israeli economy. In sum, until this begins to change, such criticism will remain peripheral and the more common appeal towards a diplomatic solution (as advocated by China) will continue to dominate. Finally, this is an approach which has done little to challenge the prominent position of the US – and suggests that the BRICS will have only marginal impact during the current Gaza crisis.